Can You Believe the Hype that Waterpik is the Best Electric Water Flosser Brand? More Americans suffer from bad breath than tooth decay. Just brushing your teeth every morning or night might not be sufficient to remove the bad breath causing germs found between the tiny crevices of your teeth. While you can use the regular flossing string to try to remove the food particles you get better results if you use an electric water flosser like the ones made by Waterpik. Even if you have the latest and best sonic toothbrush, flossing might still be the only way to remove most of the stubborn and hidden germs that might develop into smelly bad breath, and there are several water flossers from this company that deserves a second look. While there are other well-known good electric water flossers one can buy online, we focus our attention on the performance merits of the Waterpik top four electric flossers in this Waterpik reviews. The history of Waterpik can be traced all the way back to the early 1960s when it was founded by Mr. Gerald Moyer a leading dentist and Mr. John Mattingly an engineer by training. The original name that was chosen by the pair that created this entity is Aqua Tec Corp. It was later changed to Waterpik to reflect their desire to create a device for oral irrigation that can be used by regular folks in the comfort of their home. According to information from the company’s website, the founders succeeded on their 146th try, which shows a perseverance trait that is missing in this day in age. At present, the firm makes products for complete dental oral care, and also massaging shower heads. The speculation within industry folks is that the research and development unit of this company must be staffed by brilliant thinkers and scientists, as they keep coming up with better ways to floss, which can help stop bad breath in its tracks. Apart from the dozens of patents awarded to Waterpik for consumer-friendly innovations, there are numerous awards for design and technology, which backs up the claim that they manufacture some of the best electric flossers sold online. Before we get to the top selling electric water flossers from Waterpik, let’s look at some of the benefits one can derive from flossing on a daily basis with the right dental tool kit. Flossing your teeth using water is one of the most effective ways to remove most of the plaque from your teeth. It might surprise some that manual brushing is not very effective at plaque removal. If you want better oral health, try getting your hands on a water flosser that uses electricity. Using traditional dental floss is not only time consuming but also not as effective at reaching those hidden tiny food particles that can later develop into bad breath if not eliminated on a timely basis. How do you floss when wearing braces or other teeth enhancing products? A powerful water flosser can reach those food particles stuck on your implants or braces, which ultimately leads to better gum health. Here is a good video explaining the reasons why brushing alone might not create that fresh smelling breath desired by most of our fellow citizens. You’ll find more than a dozen water flossing products from Waterpik, but this review will be dealing with only four of them. The top four water electric water flossers have impressive sales record and the most feedbacks from current users. We start with the most current Waterpik water flosser the WP-950. The Waterpik WP-950 is the newest of all the electric water flossers made by this company. It is one of best complete dental care kits since it also comes with a high-tech sonic toothbrush. 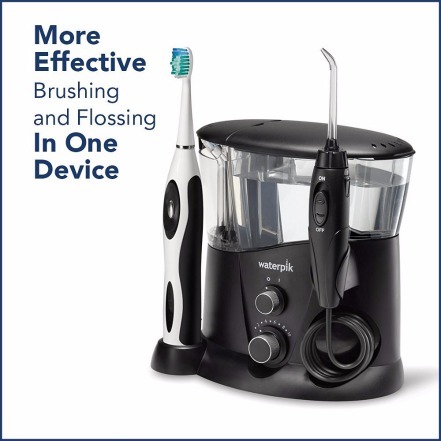 Some of the users called it a convenient device with the right tools for brushing and flossing. It is capable of reaching those food particles stuck between teeth and also below the gum line. The WP-950 is compact and will not take up much space in your bathroom. 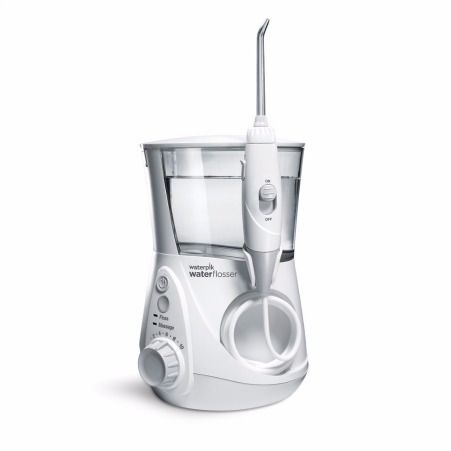 The Waterpik WP-950 electric flosser is available for purchase in two distinctive colors black and white. Just one outlet will power both the water flosser and the sonic toothbrush. It is designed to use a 120VAC/60Hz outlet for power, which means it is appropriate for use in North America. For use in other countries, you’ll need to get the right electric conversion adapter. Do keep in mind that the manufacturer will void your warranty if shipped or used outside of the designated use areas. It comes with 5 water flosser tips, which ensures you’ll find the right one even if you wear veneers, bridges, braces, or crowns. Regular use will also leave your mouth feeling fresh and clean with no sign of bad breath. The tip used is able to rotate 360-degrees. The switch for the on/off is conveniently located on the handle, which ensures ease of operation that is not matched by other brands. Not only can it be used with your favorite teeth whitening mouthwash, you get the ability to control the water pressure used for the flossing through the included 10 settings. This water flosser is able to output water at the rate of 13-ounces per minute, while also delivering 1400 pulses per minute. The WP-950 is designed to use NiMH rechargeable battery, which will last for many years if cared for the right way. You get four sonic brush heads with different designs to reach deeper into those hard to reach areas of your mouth. This water flossing product is protected by a two-year manufacturer’s warranty. 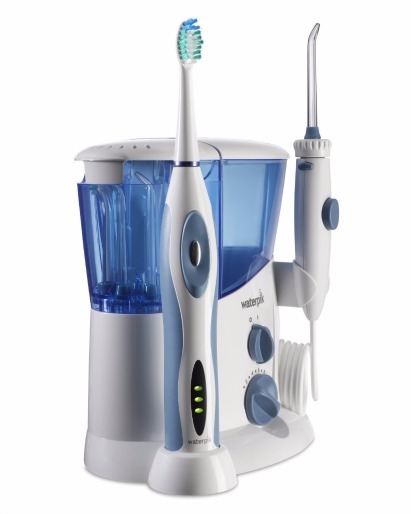 While the WP-676 might look similar to the Waterpik 950 it does not come with a sonic toothbrush. 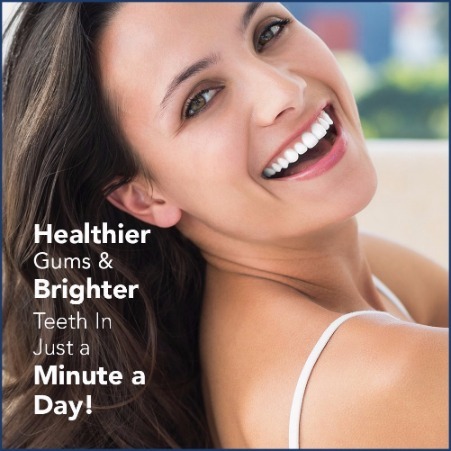 Truthfully, it is one of the best products to use for flossing on a daily basis that is if you want to get rid of bad breath causing bacteria on a timely basis. There are four designer colors to choose from and the use of chrome accents means this dental tool can complement most modern bathroom decors. The tank is capable of holding fluids that should last about 90-seconds. This flosser has 10 different settings, which can be used effectively at eliminating bad breath causing germs before they can cause any major permanent damage to your dental health. You get seven water flosser tips and a storage case to store them in. By the way, it is two flosser tips more than what you get from the WP-950. The limited warranty for the WP-676 is three-years, which is longer than the warranty for the Waterpik WP-950. Do keep in mind that this electric flosser from Waterpik is made for use in North American countries only, and requires 120VAC/60Hz voltage setting. If used or shipped outside of the designated areas your warranty will be voided. This is a good introductory YouTube video explaining what the Waterpik WP-676 professional water flosser can do to make your dental health better. The Waterpik WP-900 is almost similar to the WP-950 except for few features. You can count on this dental kit for all your oral care because it comes with a sonic toothbrush that uses high technology to remove food particles. To be able to reach deep between teeth this electric water flossing system uses pulsation technology and water pressure, which is also effective at reaching the germs that might be hiding below the gum lines. You get the use of a travel case for the toothbrush, which is made from hard, rugged, and durable materials. The pulsation technology will even work fine on braces, veneers, implants, or even periodontal pockets. If you have sensitive teeth, it is your option to use warm water or your favorite mouthwash to reach the gum lines. This complete dental care product is good at removing germs that might cause bad breath or gingivitis. From looking at the features, it looks similar to the WP-950 except for the different design setup. 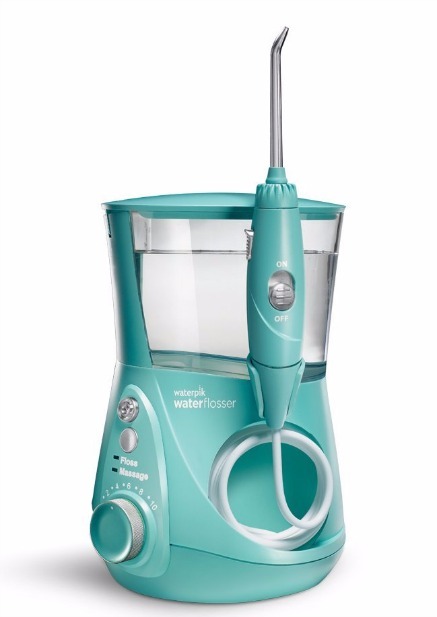 The warranty for the Waterpik WP-900 complete care water flosser is also two years, which would be voided if used outside of North America. The last most effective electric water flosser from Waterpik is the WP-660. While it is a great flosser that uses water, it comes with no sonic toothbrush like some of the other units from the same company. Some of the current users called the Aquarius WP-660 one of the most advanced flossing products one can buy online. I like the fact that it has usage mode like pulse and massage. Not only can the WP-660 help with plaque removal, it can also improve circulation as it stimulates the gums. You get seven water flosser tips and it uses LED technology to display information about the product. The manufacturer claims that with the various pressure settings, those wearing braces, crowns, veneers, implants, or bridges will find it accommodating to their unique flossing needs. This complete flossing system unit weighs less than two pounds and you get a 3-year warranty against any factory defect that might arise within the warranty period. The warranty term limits coverage to use within North America. This is an excellent YouTube video showing what the Waterpik WP-660 Aquarius water flosser can do to help you get fresh breath, while also helping to keep your gum lines healthy. Which is the Best Waterpik Flosser for You? The best Waterpik flosser for you might depend on your finances. The top product in this Waterpik reviews will be my first choice, just because it is the newest and most advanced unit. The other Waterpik flossers have all the right features one can use to maintain excellent dental health with no bad breath. If you really care about your teeth, I say get one of the Waterpik flossers with a sonic toothbrush. Having a dental care kit with the best flosser and the best electric toothbrush guarantees you’ll have fresher breath and cleaner teeth all the time. Previous post: What is the Best Wheelchair Brand?